What CB to use? Vacuum or SF6 circuit breaker? Until recently oil circuit breakers were used in large numbers for Medium voltage Distribution system in many medium voltage switchgears. 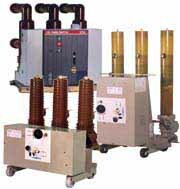 There are number of disadvantages of using oil as quenching media in circuit breakers. Flammability and high maintenance cost are two such disadvantages! Manufacturers and Users were forced to search for different medium of quenching. Air blast and Magnetic air circuit breakers were developed but could not sustain in the market due to other disadvantages associated with such circuit breakers. These new types of breakers are bulky and cumbersome. Further research were done and simultaneously two types of breakers were developed with SF6 as quenching media in one type and Vacuum as quenching media in the other. These two new types of breakgasers will ultimately replace the other previous types completely shortly. There are a few disadvantages in this type of breakers also. One major problem is that the user of the breakers are biased in favour of old fashioned oil circuit breakers and many of the users always have a step motherly attitude to the new generations of the breakers. However in due course of time this attitude will disappear and the new type of breakers will get its acceptance among the users and ultimately they will completely replace the oil circuit breakers. An attempt is made to make a comparison between the SF6 type and vacuum type circuit breakers with a view to find out as to which of the two types is superior to the other. We will now study in detail each type separately before we compare them directly. In a Vacuum circuit breaker, vacuum interrupters are used for breaking and making load and fault currents. When the contacts in vacuum interrupter separate, the current to be interrupted initiates a metal vapour arc discharge and flows through the plasma until the next current zero. The arc is then extinguished and the conductive metal vapour condenses on the metal surfaces within a matter of micro seconds. As a result the dielectric strength in the breaker builds up very rapidly. The properties of a vacuum interrupter depend largely on the material and form of the contacts. Over the period of their development, various types of contact material have been used. At the moment it is accepted that an oxygen free copper chromium alloy is the best material for High voltage circuit breaker. In this alloy , chromium is distributed through copper in the form of fine grains. This material combines good arc extinguishing characteristic with a reduced tendency to contact welding and low chopping current when switching inductive current. The use of this special material is that the current chopping is limited to 4 to 5 Amps. At current under 10KA, the Vacuum arc burns as a diffuse discharge. At high values of current the arc changes to a constricted form with an anode spot. A constricted arc that remain on one spot for too long can thermically over stress the contacts to such a degree that the deionization of the contact zone at current zero can no longer be guaranteed . To overcome this problem the arc root must be made to move over the contact surface. In order to achieve this, contacts are so shaped that the current flow through them results in a magnetic field being established which is at right angles to the arc axis. This radial field causes the arc root to rotate rapidly around the contact resulting in a uniform distribution of the heat over its surface. Contacts of this type are called radial magnetic field electrodes and they are used in the majority of circuit breakers for medium voltage application. A new design has come in Vacuum interrupter, in which switching over the arc from diffusion to constricted state by subjecting the arc to an axial magnetic field. Such a field can be provided by leading the arc current through a coil suitably arranged outside the vacuum chamber. Alternatively the field can be provided by designing the contact to give the required contact path. Such contacts are called axial magnetic field electrodes. This principle has advantages when the short circuit current is in excess of 31.5 KA. In an SF6 circuit-breaker, the current continues to flow after contact separation through the arc whose plasma consists of ionized SF6 gas. For, as long as it is burning, the arc is subjected to a constant flow of gas which extracts heat from it. The arc is extinguished at a current zero, when the heat is extracted by the falling current. The continuing flow of gas finally de-ionises the contact gap and establishes the dielectric strength required to prevent a re-strike. The direction of the gas flow, i.e., whether it is parallel to or across the axis of the arc, has a decisive influence on the efficiency of the arc interruption process. Research has shown that an axial flow of gas creates a turbulence which causes an intensive and continuous interaction between the gas and the plasma as the current approaches zero. Cross-gas-flow cooling of the arc is generally achieved in practice by making the arc move in the stationary gas. This interruption process can however, lead to arc instability and resulting great fluctuations in the interrupting capability of the circuit breaker. In order to achieve a flow of gas axially to the arc a pressure differential must be created along the arc. The first generation of the SF6 circuit breakers used the two-pressure principle of the air-blast circuit-breaker. Here a certain quantity of gas was kept stored at a high pressure and released into the arcing chamber. At the moment high pressure gas and the associated compressor was eliminated by the second generation design. Here the pressure differential was created by a piston attached to the moving contacts which compresses the gas in a small cylinder as the contact opens. A disadvantage is that this puffer system requires a relatively powerful operating mechanism. Neither of the two types of circuit breakers described was able to compete with the oil circuit breakers price wise. A major cost component of the puffer circuit-breaker is the operating mechanism; consequently developments followed which were aimed at reducing or eliminating this additional cost factor. These developments concentrated on employing the arc energy itself to create directly the pressure-differential needed. This research led to the development of the self-pressuring circuit-breaker in which the over – pressure is created by using the arc energy to heat the gas under controlled conditions. During the initial stages of development, an auxiliary piston was included in the interrupting mechanism, in order to ensure the satisfactory breaking of small currents. Subsequent improvements in this technology have eliminated this requirement and in the latest designs the operating mechanism must only provide the energy needed to move the contacts. Parallel to the development of the self-pressuring design, other work resulted in the rotating – arc SF6 gas circuit breaker. In this design the arc is caused to move through, in effect the stationery gas. The relative movement between the arc and the gas is no longer axial but radial, i.e., it is a cross-flow mechanism. The operating energy required by circuit breakers of this design is also minimal. Table 1. Characteristics of the SF6 and vacuum current interrupting technologies. Operating energy requirements Operating Energy requirements are high, because the mechanism must supply the energy needed to compress the gas. Operating Energy requirements are low, because the mechanism must move only relatively small masses at moderate speed, over short distances. The mechanism does not have to provide the energy to create the gas flow Operating energy requirements are low, because the mechanism must move only relatively small masses at moderate speed, over very short distances. Contact Erosion Due to the low energy the contact erosion is small. Due to the very low arc energy, the rapid movement of the arc root over the contact and to the fact that most of the metal vapour re-condenses on the contact, contact erosion is extremely small. Arc extinguishing media The gaseous medium SF6 possesses excellent dielectric and arc quenching properties. After arc extinction, the dissociated gas molecules recombine almost completely to reform SF6. This means that practically no loss/consumption of the quenching medium occurs. The gas pressure can be very simply and permanently supervised. This function is not needed where the interrupters are sealed for life. No additional extinguishing medium is required. A vacuum at a pressure of 10-7 bar or less is an almost ideal extinguishing medium. The interrupters are ‘sealed for life’ so that supervision of the vacuum is not required. Switching behavior in relation to current chopping The pressure build-up and therefore the flow of gas is independent of the value of the current. Large or small currents are cooled with the same intensity. Only small values of high frequency, transient currents, if any, will be interrupted. The de-ionization of the contact gap proceeds very rapidly, due to the electro-negative characteristic of the SF6 gas and the arc products. The pressure build-up and therefore the flow of gas is dependent upon the value of the current to be interrupted. Large currents are cooled intensely, small currents gently. High frequency transient currents will not, in general, be interrupted. The de-ionization of the contact gap proceeds very rapidly due to the electro-negative characteristic of the SF6 gas and the products. No flow of an ‘extinguishing’ medium needed to extinguish the vacuum arc. An extremely rapid de-ionization of the contact gap, ensures the interruption of all currents whether large or small. High frequency transient currents can be interrupted. The value of the chopped current is determined by the type of contact material used. The presence of chrome in the contact alloy with vacuum also. The most important characteristics of the SF6 gas and vacuum-circuit breakers, i.e., of SF6 gas and vacuum as arc-extinguishing media are summarized in Table-1. In the case of the SF6 circuit-breaker, interrupters which have reached the limiting number of operations can be overhauled and restored to ‘as new’ condition. However, practical experience has shown that under normal service conditions the SF6 interrupter never requires servicing throughout its lifetime. For this reason, some manufacturers no longer provide facilities for the user to overhaul the circuit-breaker, but have adopted a ‘sealed for life’ design as for the vacuum-circuit breaker. The operating mechanisms of all types of circuit-breakers require servicing, some more frequently than others depending mainly on the amount of energy they have to provide. For the vacuum-circuit breaker the service interval lies between 10,000 and 20,000 operations. For the SF6 designs the value varies between 5,000 and 20,000 whereby, the lower value applies to the puffer circuit-breaker for whose operation, the mechanism must deliver much more energy. 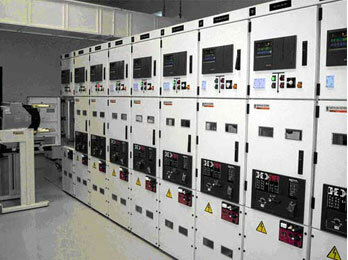 The actual maintenance requirements of the circuit-breaker depend upon its service duty, i.e. on the number of operations over a given period of time and the value of current interrupted. Based on the number of operations given in the previous section, it is obvious that SF6 and vacuum circuit-breakers used in public supply and /or industrial distribution systems will, under normal circumstances, never reach the limits of their summated breaking current value. Therefore, the need for the repair or replacement of an interrupter will be a rare exception and in this sense these circuit-breakers can be considered maintenance-free. Service or maintenance requirements are therefore restricted to routine cleaning of external surfaces and the checking and lubrication of the mechanism, including the trip-linkages and auxiliary switches. In applications which require a very high number of circuit-breaker operations e.g. for arc furnace duty or frequently over the SF6 design, due to its higher summated-breaking current capability. In such cases it is to be recommended that the estimation of circuit-breaker maintenance costs be given some consideration and that these be included in the evaluation along with the initial, capital costs. In practice, an aspect of the utmost importance in the choice of a circuit-breaker is reliability. The reliability of a piece of equipment is defined by its mean time to failure (MTF), i.e. the average interval of time between failures. Today, the SF6 and vacuum circuit-breakers made use of the same operating mechanisms, so in this regard they can be considered identical. However, in relation to their interrupters the two circuit breakers exhibit a marked difference. The number of moving parts is higher for the SF6 circuit-breaker than that for the vacuum unit. However, a reliability comparison of the two technologies on the basis of an analysis of the number of components are completely different in regards design, material and function due to the different media. Reliability is dependent upon far too many factors, amongst others, dimensioning, design, base material, manufacturing methods, testing and quality control procedures, that it can be so simply analyzed. In the meantime, sufficient service experience is available for both types of circuit-breakers to allow a valid practical comparison to be made. A review of the available data on failure rates confirms that there is no discernible difference in reliability between the two circuit-breaker types. More over, the data shows that both technologies exhibit a very high degree of reliability under normal and abnormal conditions. Today, all circuit-breakers from reputable manufacturers are designed and type-tested in conformance with recognized national or international standards (IEC56). This provides the assurance that these circuit-breakers will reliably interrupt all fault currents up to their maximum rating. Further, both types of circuit-breakers are basically capable of interrupting currents with high DC components; such currents can arise when short circuits occur close to a generator. Corresponding tests have indeed shown that individual circuit-breakers of both types are in fact, capable of interrupting fault currents with missing current zeros i.e. having a DC component greater than 100 per cent. Where such application is envisaged, it is always to be recommended that the manufacturer be contacted and given the information needed for a professional opinion. As regards the recovery voltage which appears after the interruption of a fault current the vacuum-circuit breaker can, in general, handle voltages with RRV values of up to 5KV. 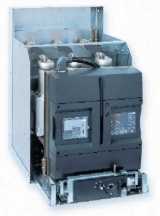 SF6 circuit-breakers are more limited, the values being in the range from 1 to 2 KV. In individual applications, e.g. in installations with current limiting chokes or reactors, etc., With SF6 circuit-breakers it may be advisable or necessary to take steps to reduce that rate of rise of the transient recovery voltage. The term, small inductive currents is here defined as those small values of almost pure inductive currents, such as occur with unloaded transformers, motor during the starting phase or running unloaded and reactor coils. When considering the behavior of a circuit-breaker interrupting such currents, it is necessary to distinguish between high frequency and medium frequency transient phenomena. Medium frequency transients arise from, amongst other causes, the interruption of a current before it reaches its natural zero. All circuit-breakers can, when switching currents of the order of a few hundred amperes and, due to instability in the arc, chop the current immediately prior to a current zero. This phenomenon is termed real current chopping. When it occurs, the energy stored in the load side inductances oscillates through the system line to earth capacitances (winding and cable capacitances) and causes an increase in the voltage. This amplitude of the resulting over voltage is a function of the value of the current chopped. The smaller the chopped current, the lower the value of the over voltage. Switching feature is attributable to the particular characteristics of the interrupting mechanism of the self-pressuring design and to the properties of the SF6 gas itself. In the early years of the development of the vacuum circuit-breaker the switching of small inductive currents posed a major problem, largely due to the contact material in use at that time. The introduction of the chrome copper contacts brought a reduction of the chopping current to between 2 to 5A.The possibility of impermissible over voltages arising due to current chopping has been reduced to a negligible level. High frequency transients arise due to pre- or re-striking of the arc across the open contact gap. If, during an opening operation, the rising voltage across the opening contacts, exceed the dielectric strength of the contact gap , a re-strike occurs. The high-frequency transient current arising from such a re-strike can create high frequency current zeros causing the circuit-breaker to, interrupt again. This process can cause a further rise in voltage and further re-strikes. Such an occurrence is termed as multiple restriking. With circuit- breakers that can interrupt high frequency transient currents, re-striking can give rise to the phenomenon of virtual current chopping. Such an occurrence is possible when a re-strike in the first-phase-to-clear, induces high frequency transients in the other two phases, which are still carrying service frequency currents. The superimposition of this high frequency oscillation on the load current can cause an apparent current zero and an interruption by the circuit-breaker, although the value of load current may be quite high. This phenomenon is called virtual current chopping and can result in a circuit breaker ‘chopping’ very much higher values of current than it would under normal conditions. The results of virtual current chopping are over-voltages of very high values. In addition to the type of circuit – breaker, the system parameters at the point of installation are factors which determine the height of the chopping current, in particular the system capacitance parallel to the circuit breaker is of importance. The chopping current of SF6 circuit-breakers is essentially determined by the type of circuit-breaker. The value of chopping current varies from 0.5A to 15A, whereby the behaviour of the self – pressuring circuit-breaker is particularly good, its chopping current being less than 3A.This ‘soft’ Switching feature is attributable to the particular characteristics of the interrupting mechanism of the self-pressuring design and to the properties of the SF6 gas itself. High frequency transients arise due to pre- or re-striking of the arc across the open contact gap. If, during an opening operation, the rising voltage across the opening contacts exceeds the dielectric strength of the contact gap, a re-strike occurs. The high-frequency transient current arising from such a re-strike can create high frequency current zeros causing the circuit-breaker to, interrupt again. This process can cause a further rise in voltage and further re-strikes. Such an occurrence is termed as multiple re-striking. Very extensive testing has shown that, because of its special characteristics the SF6 self-pressuring circuit-breaker possesses considerable advantages in handling high frequency transient phenomena, in comparison with both the puffer type SF6 and the vacuum circuit breakers. The past few years have seen a thorough investigation of the characteristics of vacuum circuit breakers in relation to phenomena such as multiple re-striking and virtual current chopping. These investigations have shown that the vacuum circuit-breaker can indeed cause more intense re-striking and hence more acute over voltages than other types. However, these arise only in quite special switching duties such as the tripping of motors during starting and even then only with a very low statistical probability. The over-voltages which are created in such cases can be reduced to safe levels by the use of metal oxide surge diverters. Switching of arc furnace Suitable for limited operation Well suited. Steps to be taken to limit over voltage. I like it… want more electrical details can u send to my mail id pls..
Its nice. I got several information. I have one request for u.. Can U pls send me some Electrical & Electronics books to my mail id. thank so much for your explanation.i think it has answered all my question. Very well written article, with complete clarity on both types of CB., & their comparison too. thank you very much for sharing useful information, please add the reference of article for more study.